We react to the needs of farmers as they are presented to us during hands on work with their herds. 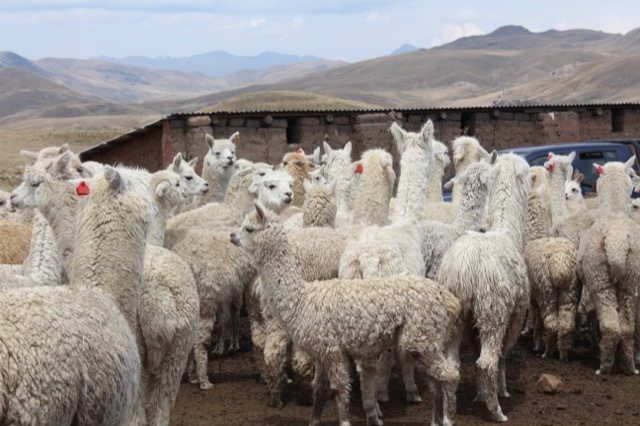 We focus on establishing self-sufficient programs to help improve the income of camelid farmers in the altiplano thereby improving the lives of the families who depend on alpacas. Our goal is to train local animal health technicians to continue the work we intitiate. Each trip requires significant financial expense to provide travel, lodging, and food, and salary for staff, in addition to rental of 4 WD trucks, fuel, and drivers to make the visits to the producers. Other costs include local guides, translators, tents, food for the entire team, and other transportation when necessary. The communities we visit receive our services for free as part of our herd improvement programs. 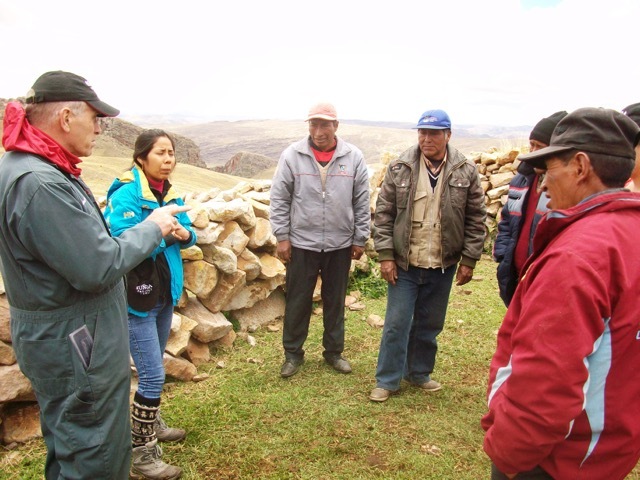 We do not receive support from any Peruvian organizations because it does not exist for this important work which makes a huge difference in the lives of the farm families we service. Over the years we have made a positive impact on approximately 50 rural families. On the next trip occurring in early December we will be working with alpaca farmers in Pucara and Lampa where we have been working for 3 years and a new community further north near Marangani which is asking for help with alpaca production. 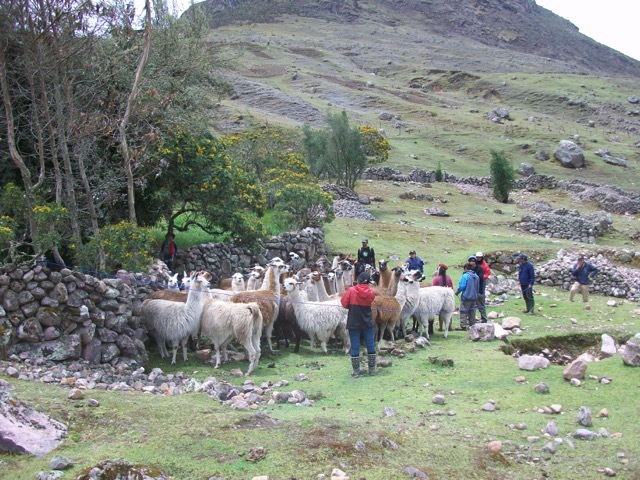 In addition we will be working with llama producers near Urubamba in the Sacred Valley of Cusco in the community of Cuncani. 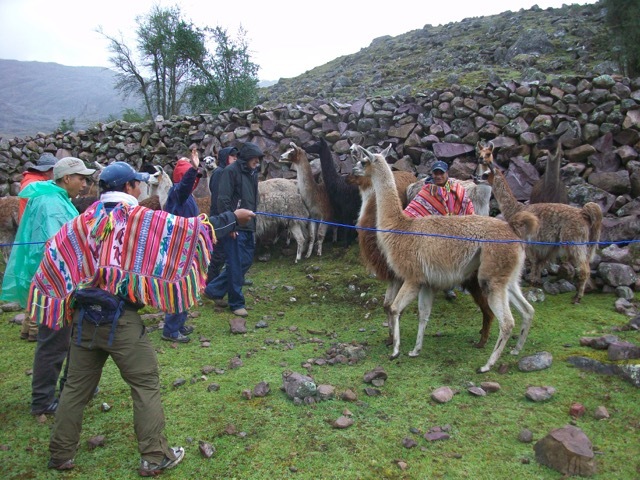 Our work there is similar to that with the alpacas in the south but is geared towards helping farmers to produce and maintain health of llamas to be used obtain work as pack animals along the Inca Trail. This campaign is for financial support for the upcoming trip in early December 2017 for which we need $14,750. Please consider a tax deductible contribution to help us complete this important work. Our last trip took place in July of this year. CLICK HERE to a view a report on what we acomplished on that trip. 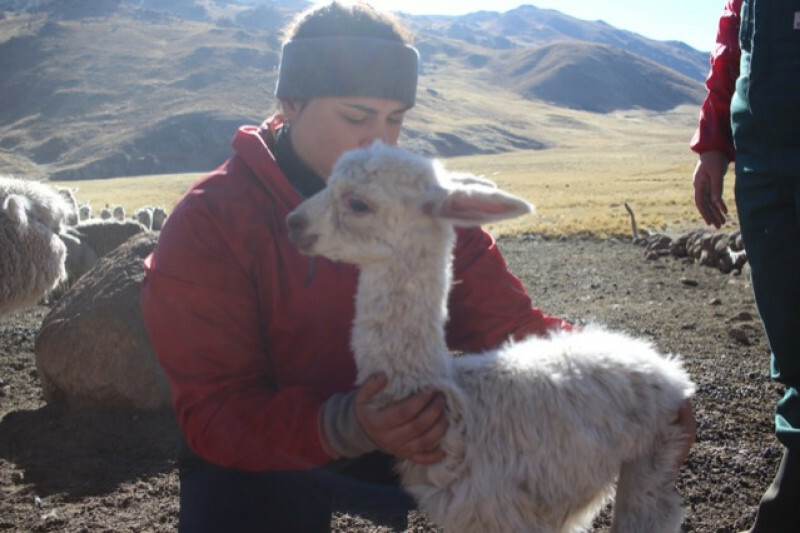 Visit our WEBSITE for learn more about the Nuñoa Project and how we have helped Peruvian Alapca herders with both veterinary and humanitarian support. A big thank you to all our supporters who helped to make this trip possible. Although we didn't raise enough money to cover all of our expenses, your donations helped a lot and we were able to accomplish all we set out to do. Our next trip to Peru will be in July....stay tuned! 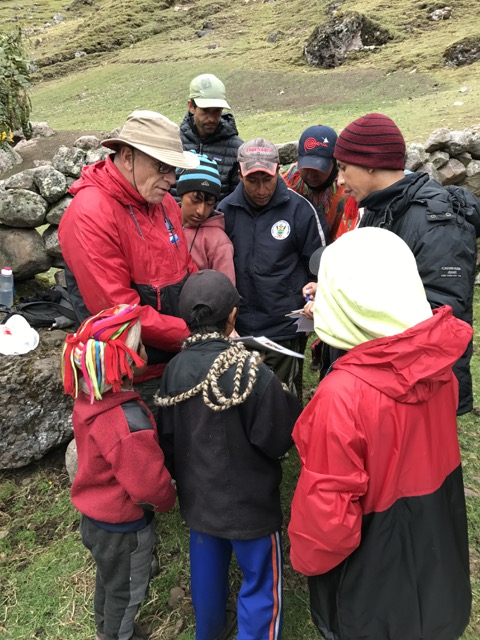 Our team finished up this winter’s veterinary work trip in Peru with two days of llama work in the community of Cuncani near Urubamba. We worked with 9 farm families over 2 days. Each camelid community in Peru seems to have a unique personality and Cuncani is definitely an upbeat and happy place to work. It was a 3 hour drive from our home base in Urubamba over some high mountain passes and very windy roads. When we arrived in the town of Lares about 30 minutes from our final destination we found many workers there digging in the streets and installing new water and sewer pipes. It was a short walk with our gear to the other side of town where we transferred to a station wagon for the remainder of the trip. We stayed in a community school classroom and ate our meals in the school kitchen building. The scenery was spectacular and true to form all herds we visited were uphill from the base camp. The hiking was not long but it was very steep. We were acclimated to the altitude at that point and luckily did not have rain during the 2 days. We evaluated 9 small herds with the common finding of low body condition in most of them. This varied depending on the available pasture. We evaluated several breeding males which were mostly good. I estimate that about 50% of the anima ls were small for use as packers but most herds had enough to have string of animals. The last herd we evaluated on the second day had the best llamas we have ever seen in Peru. These tall Ccara llamas had good body condition and herd pregnancy rate. The owners are eager to start into packing for tourist treks and hopefully will be able to get going soon. They can certainly serve as a model for other farmers in the community. It was an excellent end to our work in Peru. The day after our last community visit the team members all went there separate ways. One stayed in Urubamba, another went back to Lima, another to Tacna Peru, one back to the UK, and two of us back to the US. This team came with different experience levels with camelids but all had much to contribute to the work. They were a very fun group with which to work. Hard work and minor adversities have way of bonding team members and this trip was no exception. I expect and hope that some will work with Nunoa Project in Peru in the future. 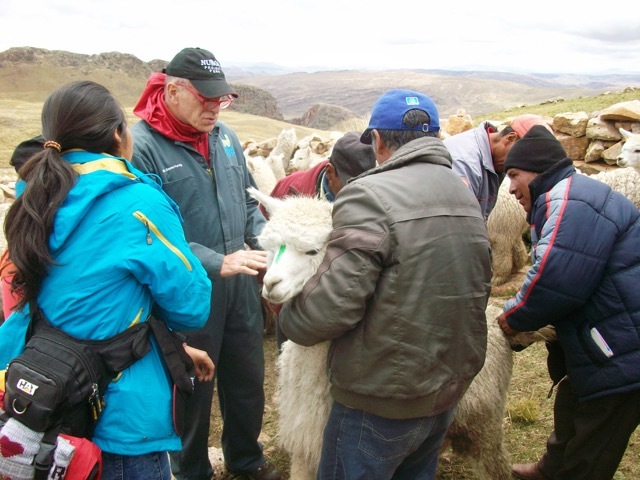 Overall during our 2 weeks in Peru we handled and evaluated approximately 450 alpacas and llamas for 28 farmers. Progress is being made for farmers we have visited in the past and I feel optimistic about the future for the new farmers we met. We have the incentive and skill to help the farmers to improve their animals’ health and production and thus to increase their family income. It is always humbling to meet and work with Peruvian camelid farmers. 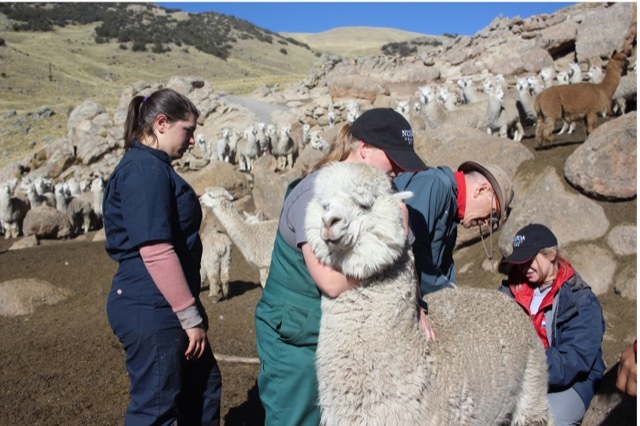 Please help us to help them and to train future camelid veterinarians and scientists in Peru and the US by making a tax deductible donation to the Nunoa Project through our website or by mail. Your money will be well spent where there is a great need. Please give generously to help us help others. To help support this important work please [visit our website]( http://nunoaproject.org) to make tax-deductible contribution. 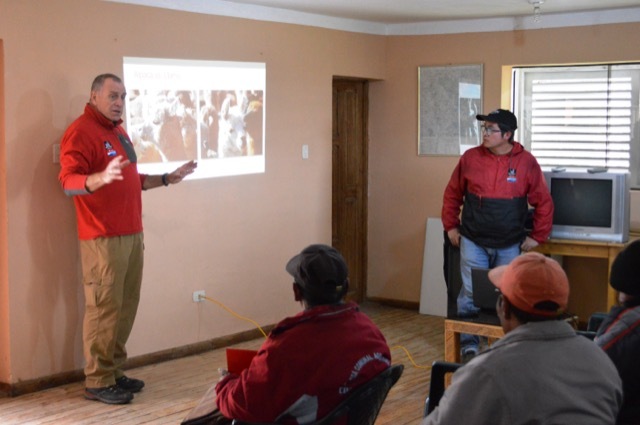 Our last alpaca work for this veterinary trip to Peru was a hands on alpaca breeding male selection workshop with 10 farmers from the communities we work with near Pucara and Lampa in the southern Peruvian Andes. These farmers were instructed by the Nunoa Project veterinary team in evaluation of conformation, fleece, animal health (in particular determining body condition score), and assessment of the testicles. We emphasized testicle size and consistency on palpation. The participants will in turn pass on the lessons they learned to others from their communities. They were eager to learn and contributed important points to the group themselves. Improvement of their herds is best done by using only superior males to continually upgrade the offspring they produce. These crias become their future breeding herd animals. Drs. Purdy and Diaz also provided a Power Point presentation illustrating the components of superior male selection. Some of the farmers are currently looking for new males for the breeding season starting right now. Our Nunoa Project superior breeding males will be distributed by Dr. Diaz this week. Along with improvements in breeding management we expect the herds will continue to improve. The income of these farm families comes primarily from fiber sales. Usually half of their herd is sheared every other year by hand. Most animals’ fiber does not grow fast enough here to allow for yearly shearing. The farmers are paid by the pound by local buyers who sell to regional buyers who then sell to the mills, who set the price. There is no adjustment for fiber quality at the present time so density and staple length are what the farmers and we concentrate on. This is provided to the offspring by using males with those qualities. We are very much looking forward to seeing the first crias sired by our superior males when we return to Pucara to work with the communities again in July 2018. Some farmers from Nunoa District, where we started our work, are interested in having us come back next July and we are looking forward to that. The needs of the farmers and the people to fill those needs (us) are there. All we need is your financial contributions to meet our $120,000 per year budget. Please consider a generous year-end tax deductible donation to the Nunoa Project which can be made through our web site. Please also consider becoming an annual donor to Nunoa Project. Thank you! 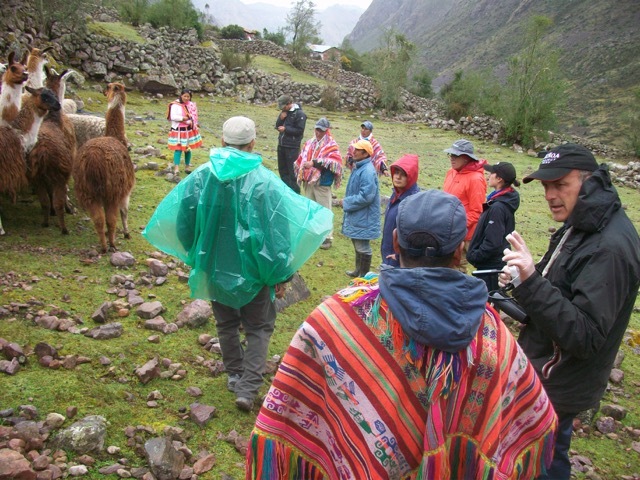 Today’s Nunoa Project community visit in the Peruvian altiplano was to LaUnion. The first farm was that of Mario Idme and his wife. They have a spectacular view from the house which looks out over a big valley with several mountain peaks in view. It takes quite a while to get there because the road is normally used only for motorcycles like the one they use to get back and forth to town for supplies. They have both Huacaya (fluffy) and Suri alpacas (think dreadlocks) along with a herd of sheep and several friendly dogs. They are very gentle people, probably in their mid-fifties in age, and it is reflected in the good temperaments of their animals. They used one of our males January to April 2017 and their excellent breeding management program resulted in a 96% pregnancy rate, the highest we had ever seen. Their animals were in good body condition as always. Mario is the community president and is a pleasure to work with each trip. Our next farm for the day was back down the small and windy road to the home of Andreas Idme and his wife. LaUnion has several Idme families. They have alpacas, sheep, and cattle and not so friendly dogs (doing their guard jobs well). Again the animals are well treated and so easy to handle. The Idmes set an new record with 100% of their animals pregnant (16 of 16). Most of the farmers we work with have small herds of 20 to 40 animals with one community herd having 150 animals. These small herds are very different from Commercial farms but need help to improve their production and standard of living. We strive to create simple solutions which can be implemented simply. 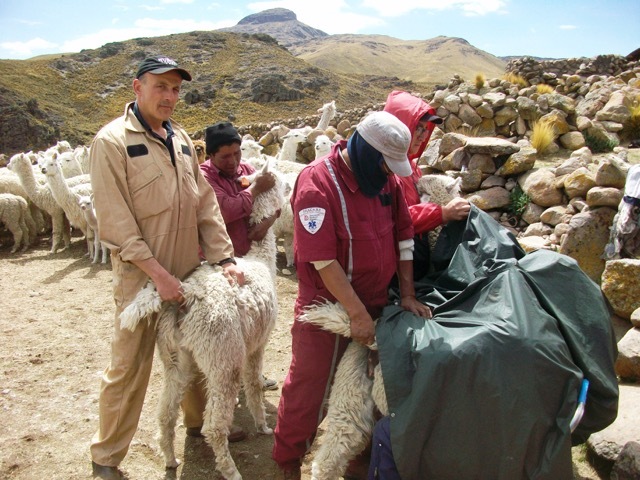 Overall in Pucara and Lampa we examined 170 female alpacas and 126 were pregnant (74%). That is certainly good. Dr. Gerardo Diaz will be lending out our superior breeding males later this week. We have one more event here, a hands on breeding male selection seminar with several members of the breeding communities here. A report will be coming soon but the internet has been a bit sketchy recently. Thanks for reading and please consider financial support for this important work. 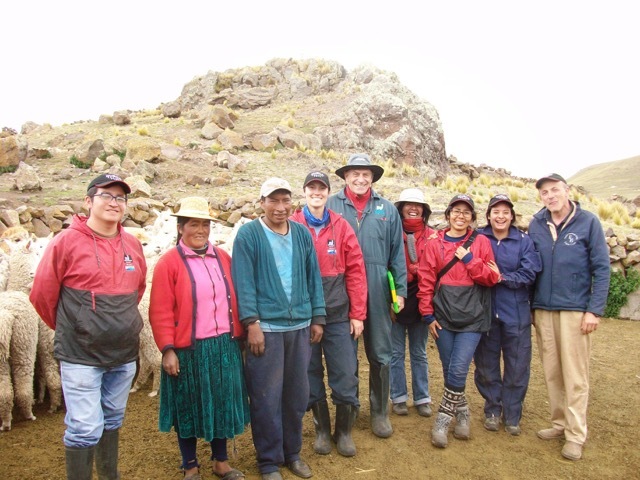 Today’s Nunoa Project Peruvian farm visits near Pucara in the southern Andes included 3 herds in the community of Sapamccota. Then owner of the first herd has also been taking care of our machos which we loan out to area farmers so we thoroughly examined them. A few are close to retirement after years of service. 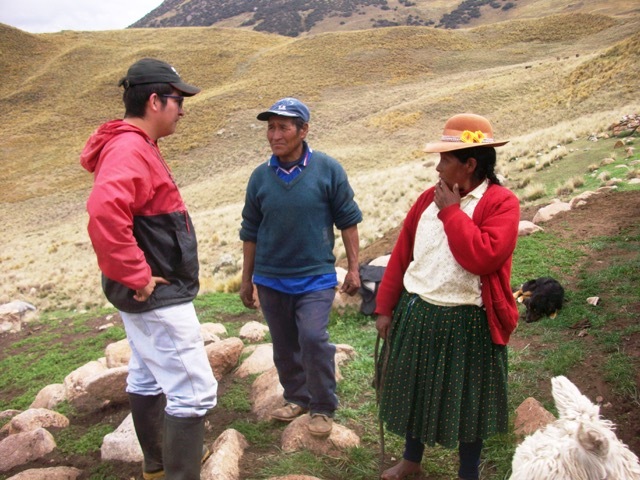 Males in the altiplano tend to be retired due to poor body condition at approximately 10 years of age according to local farmers. The same is true of females. We are also starting a small project here with increasing nutrition to try to correct softening of the testes in older males. The 3 farmers we visited were Francisco Quispe, Fidel Apaza, and Natalia Choque. We have been working with all three for three years and they have been borrowing our superior males to breed to their females. Francisco herd had approximately 90% incidence of mange in his females and low body condition. The herd pregnancy rate was 60% which is lower than we usually see in the area. We suggested that he try to provide better pasture, but this might prove to be impossible as his land is limited. Fidel’s animals had very little mange, good BCS averaging 3 of 5, and a pregnancy rate of 70%. Natalia Choque was the last farmer whose animals we evaluated. Her herd pregnancy rate was good at 83% and the animals’ body condition was satisfactory. She had some mange cases which were responding to injectable drugs. She will be using another Nunoa Project male this breeding season. Two new farmers from this community have expressed interest in working with us starting this breeding season as they have seen the benefits to their neighbors of our help.